The first thing I noticed about this issue was the banner at the top advertising the Green Lantern film due out June 17 “only in theaters.” Now, I know Marvel has done this for YEARS, but they’ve generally done it by way of the upper corner box by the issue’s number and such. 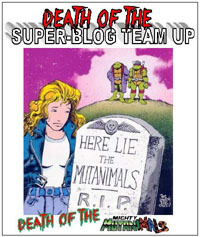 And I appreciate this on the GL books–it’s most appropriate there. But on a Superman title, it’s less appropriate, except as the full-DC-wide blast of the advertising. After all, why hide the ad on an interior or the back cover when by having a banner at the top, you’re advertising off any and all ways of displaying comics that allow the top portion to be seen? That aside…the cover doesn’t impress me all that much. I do appreciate that Doomsday looks a lot closer to what I’m used to than it has in awhile. But the image does seem rather generic to me–Doomsday standing amidst wreckage, the bodies of the Superman Family sprawled at its feet. Something about the imagery just doesn’t do it for me. Then again…the cover is not why I bought the issue. 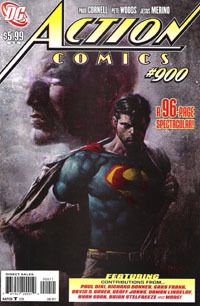 The story picks up where the lead story of Action #900 left off–the Superman Family has found that they are facing several Doomsdays, each tailored to a diffeent power set, but all set on destruction of the entire group. Cyborg-Superman welcomes destruction, the chance at death. 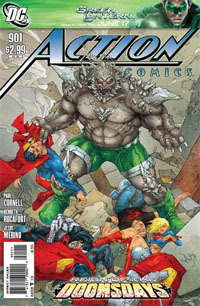 The others, however do not–so after Superman neutralizes the Cyborg, the group gathers up and heads away from their attackers into the depths of the prison they’ve found themselves in. Meanwhile, on Earth, an imminent extinction-level event is detected, and (in contrast to the controversy over a short in the previous issue) the American President proclaims the country’s need of Superman, of any super-powered beings able to help. 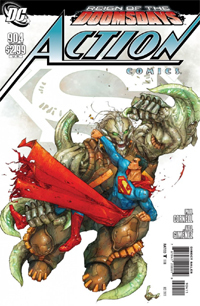 As Superman & Co. realize their prison is fast approaching Earth, they encounter yet another threat, who steps forth to prevent them from saving the planet. Without wasting time arguing, he delivers a shocking blow to the group, leaving their reaction as our cliffhanger. I’m not a huge fan of the split art duties on the issue. Rocafort‘s visual style seems a bit “off” to me, and reminded me of my least favorite art from #900, though on a double-checking, it’s not the same. There’s something to this style that makes the characters seem overly generic, Superman especially. Somehow it looks to me more like some guy in a Superman costume, and the face alone doesn’t say “Superman” to me. Merino‘s art in the middle of the issue stands out, and is far preferable to me–the characters look a lot more “on” on those pages…and it makes it rather jarring to then shift right back to a different visual style. Cornell‘s writing is solid…I haven’t yet read much of his work…the first issue of the Black Ring arc and then the lead in Action 900. But I do like the concept, at least, that’s at play here…and I really enjoy having Superman teamed up again with Supergirl, Eradicator, Steel, Cyborg, and Superboy. And given the first time these characters all got together, it’s fitting that they’re dealing with Doomsday. Given this context–their teamup, and the Doomsday situation…I’m tentatively hooked. I came back for this issue, having figured to only pick up #900 as the anniversary that it was. While much of the story is fairly serious and played straight…there’s a part where we actually get a thought balloon for Superman, which seems somewhat out of nowhere–especially as I’ve grown used to the LACK of thought balloons in favor of “voiceover” narration and such. The use of the thought balloon in this issue seemed hokey and a bit forced; and momentarily took me out of the story while I thought about it. Not a huge deal, but noticeable. Where the story is most hurt in my eyes is that I have no idea how many chapters to expect…just as I had no clue how many to expect, really, with the Reign of Doomsday hopping along through various other books without really meaning much. I certainly hope this arc is not dragged out…though this is labled Reign of the Doomsdays part 1 (escaping Reign of Doomsday which was around a half-dozen issues), it’s essentially the same story continuing, so this feels like the 7th chapter, and I’m not sure I’ll want to stick around long-term if it’s simply a dragged-out slugfest or punch-and-run-and-punch-again kinda thing. While this doesn’t really hold a candle to Reign of the Supermen, if you’re a fan of these characters, this packs a good bit of nostalgia and hope of a new classic. Worth picking up if you enjoy seeing these characters all brought together, and/or if you read #900 and want to follow this Doomsday story. As of now, I’m interested enough to see where this goes that I plan to come back for #902.